Until he was nearly 30, Jerry Smith had never painted, but he wondered what it would be like to be an artist. “I just felt this need, this desire, to paint without even knowing much,” he says. Still, it wasn’t until his wife, Cindy, bought him a set of oil paints as a Christmas gift in 1971 that he finally picked up a brush. In 1976, Smith left his job in human resources at R.R. Donnelly & Sons to focus on his painting. He joined the Brown County Art Guild and opened the Green Street Gallery, his studio in Crawfordsville, Indiana. A 1975 workshop marked Smith’s introduction to plein air painting, a hallmark of his portfolio. A member of the Indiana Plein Air Painters Association, Smith fell in love with the rugged beauty of the Maine coast and with painting in nature. 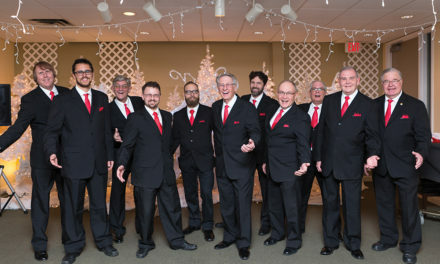 Sounds of Indiana Barbershop Singing Lives On!